more pages added to my folder. I would not have myself any other way. "As one cat said to another: Birthdays are like fur balls-the more you have, the more you gag." as I stare at myself in the mirror. Where is my youth with that eternal fun? Share insights with friends, over a nescafe 3 in 1.
and this my own destiny I have chosen. I would like to dedicate birthday wishes to my dear friend Yeen who will be celebrating her birthday tomorrow 28th February and also to mamamia who celebrates her birthday too this month and not forgetting someone's sister who is sharing same day as me. Happy birthday to all of you and may we always be protected by HIM in health and sickness. The 27 international students with their country flags awaiting the arrival of our minister Dr Vivian Balakrishnan. My plate of yummy munchies at the reception .... itu sambal udang makan dgn keropok nasi so syiokkkkk..... hehehe ... not bad eh special birthday tea. The happy look of a 59 yrs old lady ... just taken 20 minutes ago ....at 11am. it's supposed to be tomorrow kan.. 27th Feb..
my wish - hope you will enjoy your beautiful life and may Allah bless all your days ahead.. 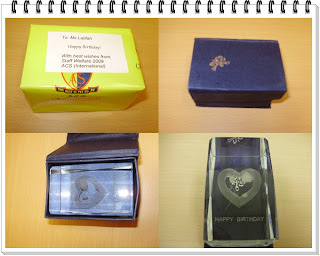 Happy birthday dear akak vogue sayang mucuk...A box of chocolate is on its way to ACS bring my wishes and love to you. panjang umur nya,pjg umur nya pjg umur,jua murah rezeki..yayy! semoga hidupmu penuh dgn rahmah dan barakah! thank you too for all the doas. mana bolih tipu dgn umur..sesungguh nya 59th tahun pB dah masuk senior citizen...tak bohong. thank u dgn ucapan dan doa ye...dan pB pun semoga cepat sembuh. Happy Birthday to Kak Elle... Wah, muda lagi wei... Honestly, you don't look like you're 59. Moga dirahmati Allah dan ceria selalu. Semuga Di panjang kan umur,murah kan rezeki dan sentiasa di pelihara Allah hendak nya..Muarggh!! ((((Hugs)))) you. May your days always be blessed. Happy Birthday Kak Elle..hope that you'll be blessed with excellent health, joy and happiness in life..
thank you for the kind wishes ya. Age is just a number...you are forever young in our hearts! Vogue always..keep cool, stay healthy, be happy always..and may Allah bless you! Happy bithday...kebahagiaan, kesihatan dan kegembiraan itu memang milik akak..anugerah tuhan. cheese. 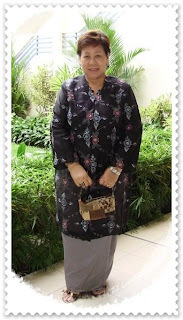 Happy 59th Birthday, Kak Elle. Moga dimurahkan rezeki, diberi kesihatan yang baik dan kebahagiaan berkekalan sesama insan. rina pun take care ye semoga cepat sembuh. Happy birthday kak elle...tak sangka dah berumor 59 tahun !! selamat hari lahir yg ke 59.. tahniah..
semuga panjang umur sihat tubuh badan di murah kan rezeki dan di permudah segala urusan amin..
A very happy birthday to kak elle...and many more to come. are u sure there's no typo here kak? i dont believe it...u look soooo mucchhh younger..
the food look so yummyyy....aaa...and coach bag tu...kelasss gittewww..
eh muka org umur 59 lain ke?